Here we go with another Deluxe Titans Return review. This time I’ll be looking at Decepticon Triggerhappy and his Titan Master partner, Blowpipe. This figure came in wave 3 and what a pleasant surprise he was. I was born too late and missed the first coming of the Transformers. I got the tail-end of it. 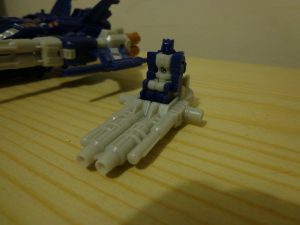 One of the toys I had was Targetmaster Triggerhappy. I have fond memories of that toy and how awesome it was. When he was announced for this line, my head just about exploded. I was instantly transported back to childhood. My little fingers would get caught in some part of his transformation. It hurt but I kept going back to it cos it was just a damn good toy. 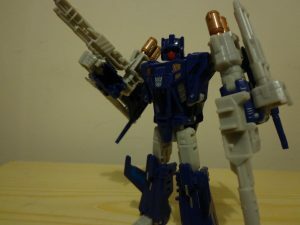 Now fast forward nearly 30 years and Hasbro have just about revisited every other character in their growing roster of updates, now it’s Triggerhappy’s turn. The result is a more than adequate deluxe figure with an incredible ingenious transformation process that looks great in both modes all while incorporating the latest gimmick. Sometime Hasbro still impresses. The jet mode is fantastic looking and armed to the teeth. It’s so sleek and has barely any robot parts hanging out. Ok, if you turn him over you can quite plainly see his legs but when an alt-mode is pulled off so incredibly well at this scale, it really doesn’t matter. 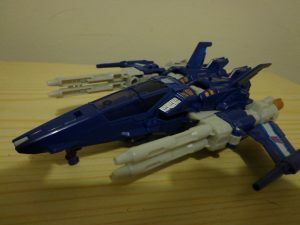 It replicates the colours of the G1 toy almost perfectly with its dark blue hull, grey cannons and gold-coloured fuselage (if that’s the correct term). 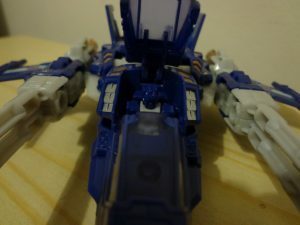 Included is the now-mandatory Titan Master cockpit which is so well integrated that if you didn’t know it was there, it wouldn’t be obvious until you transformed him. There is a surprising amount of painted detail in Triggerhappy’s star fighter mode. In addition to the standard Decepticon logo, we’re also treated to stripes on his wings in addition to gold and silver details picked out around the cockpit and towards the back. It shows that Hasbro can do it when they want to, but doesn’t explain why they don’t other times. 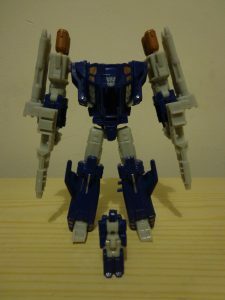 Triggerhappy is packing heat with two pistols that, in robot mode, can be dual-wielded or attached to the undersides of the wings in star fighter mode. This, in addition to the guns already attached, leaves him pretty heavily armed which is ideal for a bot whose motto is “Have gun. Have fun”. These two guns can also join together which provides a seat for the titan master. This seems a little pointless on this figure since there’s nowhere for this gun/chair to plug in on the vehicle, or at least nowhere that it doesn’t look ridiculous. Blowpipe is your standard Titanmaster. Besides the massive face on his back, the only colour is from the plastic. There is a little variety in colours, though, as he is cast in both dark blue and off-white plastics. Being from one of the newer waves, he now has a pin through the hips holding those suckers on as previous waves have had a habit of having very loose legs or worse; getting totally legless. To transform into robot mode is an absolute blast. It’s one of those transformers that’s unlike anything else you’ve seen from Hasbro. It’s difficult to describe but the entire mid-section spins around on a pin so the bottom is now the top and vice-versa. 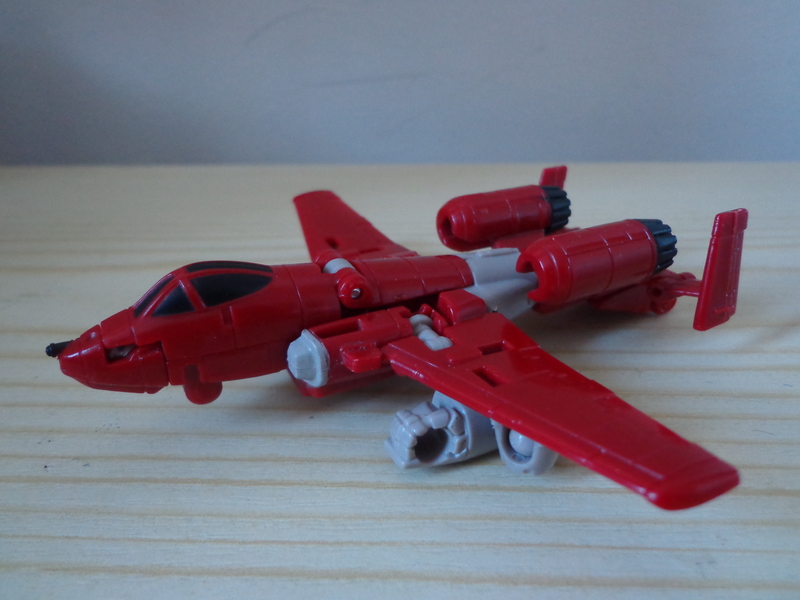 It also addresses the issue that the 1987 toy had with the cannons being all floppy when you fold them up onto the arms. This one has ratchets. So to summarise thus far, you’ve had an excellent alt-mode and an interesting transformation. This must be where Hasbro drops the ball, right? Wrong. Instead we have an incredibly well-designed, well-engineered bot mode with fantastic proportions and a permanent power-stance. Seriously, his feet are angled so that when positioned correctly, he gives off a ‘come at me bro!’ vibe and it suits his characters down to a tee. As with others in the line, he has brilliant pose-abilty. He has a nice ninety degree bend at the elbows and a bicep swivel. Thanks to the transformation process there’s also a nice deep knee bend. He also has a good range of motion with up and down and side-to-side joints in his shoulders. Another issue that has plagued this line thus far has been incredibly loose ball-joints on the hips. Thankfully mine doesn’t have this issue. The joints aren’t particularly tight but he doesn’t become a ragdoll as soon as he’s picked up. That’s a win in my book. The fantastic paint-details from the vehicle mode show up here in robot mode too. Hasbro seem to have put way more effort into this guy than they have previous releases. 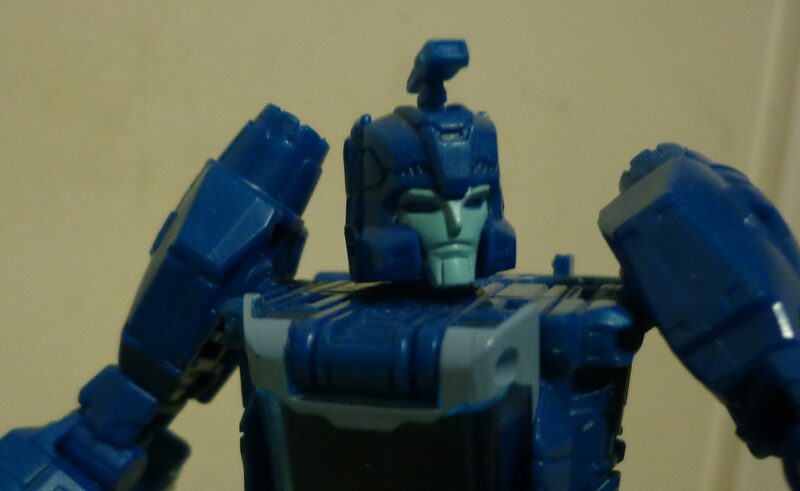 There’s not a single side of this Triggerhappy-chappy where you can’t see a paint app or too. If Hasbro can maintain this level of quality, I don’t mind paying through the nose for these quite as much. 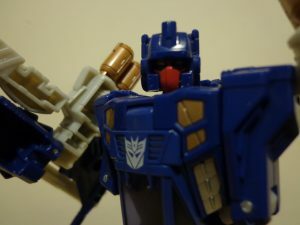 The head sculpt (or back-sculpt for Blowpipe) is also really well detailed and a faithful to the original character. 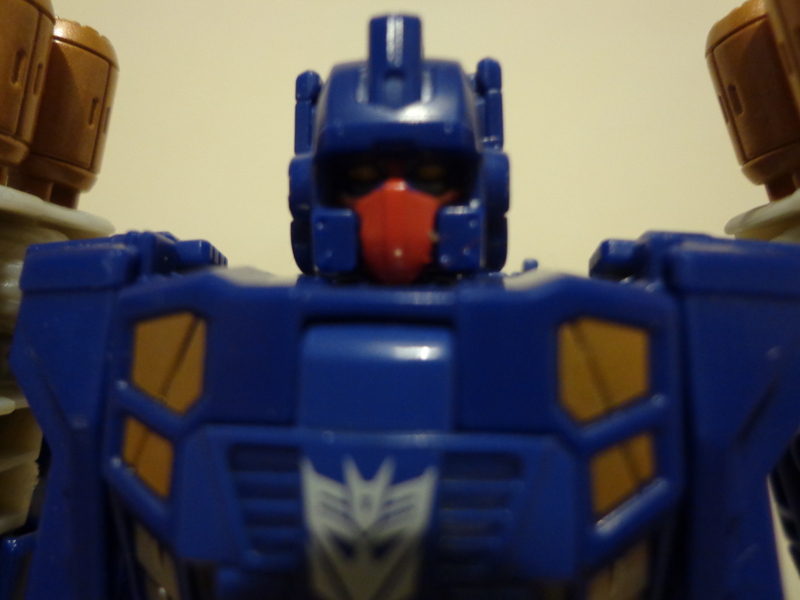 I particularly like the red faceplate and the way it contrasts to the rest of the blue plastic. Not to mention the evil yellow eyes peering out from underneath. An enemy Autobot would be right to be intimidated. This line has been excellent thus far. They’ve throwing out some unique molds and nowhere near as many repaints as Combiner Wars. Here’s hoping they stick to this current trend. I have to recommend picking this figure up. Not only is it great homage to one of my favourites from the olden days, but also an impressive figure in its own right.